The answer is simple! Because your dashboard is the first thing that users will look at while interacting with your product. It has to be understandable in one glance to be usable. Besides, all the brilliant technologies such as AI, Blockchain, Machine Learning are useless to the users if they are not presented in a user understandable way. This is why dashboard designs require a thorough thought process. Given, the importance of the dashboards, today we would like to address the popular query i.e. ‘how to make a great dashboard UI’. An effective dashboard is a visual board for simple conclusions of a rather complex set of information with a call to action. This means the dashboard provides information on which the user can base his decision on. A great dashboard is easy to understand and presents all the key insights. Besides being extremely intuitive, a good dashboard is easy to customize. Now, the point is how to come up with a dashboard which can pass for the above characteristics. Here are a couple of notes regarding the visual design that one must keep in mind while designing dashboard UI. To be consistent means to have undeviating design across the dashboard. The design should be consistent on all the devices of varying sizes. The functionalities in terms of fonts, colors, elements’ placement, navigation and style charts also need to be consistent. The golden rule is to design the smallest screen first. This approach helps in creating appealing spaces for more important information first and then leads you towards creating a great UI which enhances the abilities of the UX as well. ‘One size fits all’ approach is not the road you would want to take. Simple Reason being, usually there are multiple user roles with varying priorities and needs. Also, the designs ought to be scalable. Users should be the choosers on how they want to customize the design as per their business needs. A good dashboard design should be able to accommodate all sorts of complexities and should allow for easy customization as and when required. With visual design, the vital information can be communicated to users in a usable and appealing manner. Also, with the crucial content placed and finalized, the design guidelines and layout can be easily defined. – The card layout is recommended because it allows concise data classification, along with scalability and flexibility. – Users perceive the center portion first so the central alignment is preferred. – To highlight any important information a distinctive color should be used. Usually, in order to come up with fancy visual representation, designers get drifted and adopt complicated charts. Keep the charts simple and try to present all the variety of ideas in an easily understandable form. The main reason being charts are the prime data visualization tool for the users and should be easy and concise so that the user can perceive the information in one go. – Prefer pie charts, bar charts, and line charts as they are easy to understand and fit well in complex places. – Use flat design charts instead of 3D charts, they are neater and easier. Icons are very small components of the dashboard but they hold great significance. A great dashboard should have icons which are familiar. The reason being that a dashboard is frequently used by users and are accessed for prompt information or actions. Therefore, familiar icons reduce the processing time and deliver better performance. Colors are more vocal than you think. Just as how traffic signals communicate to us with red lights signaling us to stop and green lights allowing us to drive, color psychology is important in UI dashboards as well. A great dashboard should be designed with mindful colors and any possible confusion should be avoided. It is very important to keep both font style and size consistent while designing the UI and UX of a dashboard. It is highly recommended that not more than two font styles should be used. With minimal variations in font style, the dashboard holds a neater appearance. It is advised to create a visual hierarchy of the written content for better visibility. This can be done by placing the crucial information in the larger font size and probably with different color and less important information in relatively smaller font size. 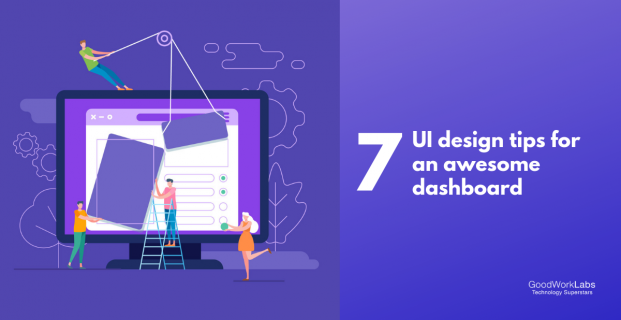 All the above tips will help you to come up with a great dashboard UI but studying the user’s requirement is the first step before all these. It is easier to design a dashboard once you are through with user’s preferences and style because then you can customize the dashboard around the specific needs of the user. A useful dashboard is way better than a well-designed but unrelatable or complex dashboard. An unrelatable dashboard is one which is not knitted around the individual business needs of the user. For example, a corporate dashboard for a school. The UI of the dashboard makes it great or just okay, the choice is yours! At GoodWorkLabs, we have some awesome dashboard designs to exhibit for your perusal. Our team of experts can help you bring life to your ideas and create eye-catchy UI and UX designs.